We all saw many lucky leprechauns among those that celebrated St. Patrick’s day and that got me thinking about some other little green guys in a book I just read. When the folks at Seasons of Smiles dental office went to Yankee Dental Congress in January we learned about lots of new technology as well as some fun treats. One of those fun treats for me was buying the book Sugar Bugs by Erica Weisz and Dr. Sam Weisz. I have been on the search for a way to explain to my children the importance of healthy eating as well as brushing and flossing. 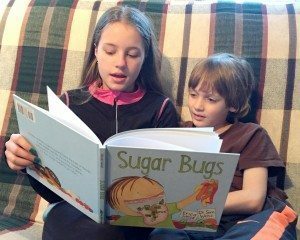 Sugar Bugs tells the story of the Mutans family which are the nasty bugs that would love to occupy your mouth, destroy your teeth and gums and give you atrocious breath offending all those around you. The Mutans are represented as little, round green guys causing havoc. A little boy named Robbie is the main character in the book who does not see how important it is to eat well, brush and floss. The Mutans family are elated to have found a perfect place to live in Robbie’s mouth. The book describes the environment of an unhealthy mouth in a way children (and adults) will understand and the illustrations are brilliant. Of course there is a happy ending with Robbie visiting the dentist and starting his new journey to a healthy mouth by making better food choices and being consistent with his brushing and flossing. Many people believe that they can eat what they want as long as they brush and floss. But it takes more than that to keep a mouth healthy. Exemplary oral health practices do promote overall health but the first step is the food that we eat. Whole foods with the least amount of additives and a focus on fruits and vegetables is a perfect place to start followed by brushing and flossing. Your mouth, body and mind will thank you by having more energy and focus and less illness and who wouldn’t want that? If you have little people at home that are resistant to eating healthy, brushing and flossing, then Sugar Bugs is the book for them. Adults can benefit from reading this with their child(ren) in more ways than one. Are you interested in a sugar bug free smile? Are you interested in the best oral health for you and your family?